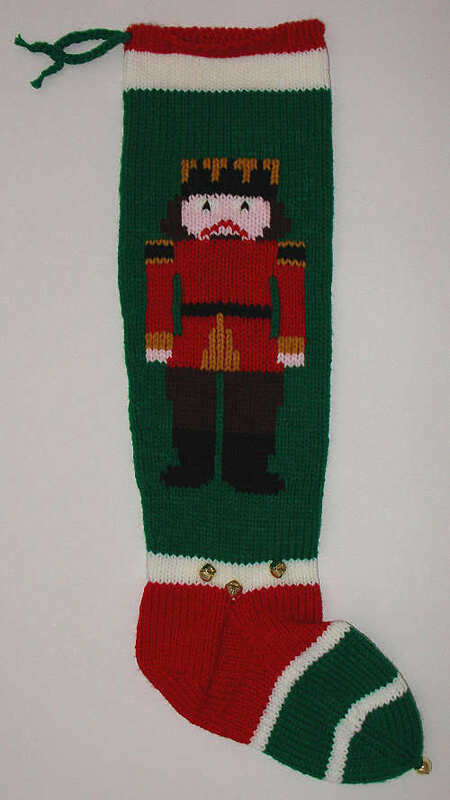 Here are examples of custom Christmas stockings that I've knit with nutcracker pictures on them. The pictures can also be interpreted as toy soldiers, of course, since nutcrackers are most often modeled after soldiers. Nutcrackers are more closely associated with Christmas, however, thanks to the famous ballet. Please look to see what Customers Say about stockings I've knit with nutcracker pictures. This toy soldier is standing at attention with rifle by his side. There is some particularly nice detail on the uniform. Here is the same toy soldier on a different background, with sequined snowflakes. The overall stocking design is more complex than the previous version. Alternate view of the same stocking. 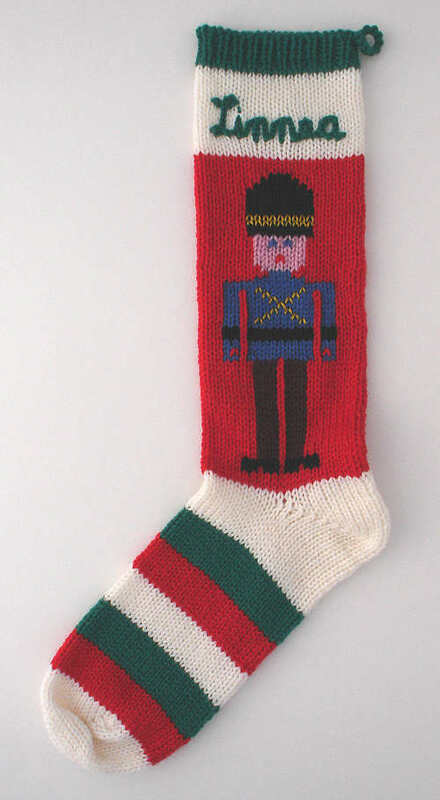 This is a wonderful drummer boy design that I've knitted in several variations. This one is bordered by sprigs of holly with white bead "berries". Here is the same drummer boy on a stocking with a very different layout. This is another version of the drummer boy, with a plain white background. A classic 3-stripe design, with pictures chosen for the customer's grandson. This tiny soldier is very colorful. Another tiny soldier for small spaces, this one is shorter than the one in the previous stocking. He's equally colorful, though, with nice detail on the jacket. This miniature soldier is a bit bigger than the previous two, and has more clearly defined arms and legs. The gold trim and blue trousers are common to many nutcracker pictures. This custom design was created to represent a scene from the classic ballet. The recipient's name really is Clara! This was created to match the style, but not the pictures, of other family stockings. The cursive name is quite unusual. The toy soldier is very British in appearance. A classic style nutcracker, this one has hair and eyes to match the recipient, and specially chosen gifts on the foot. 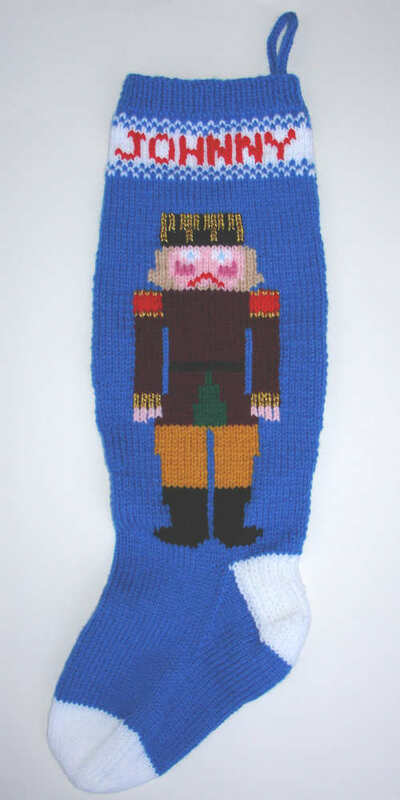 A companion to Hunter's stocking, the blond hair and blue eyes match the little boy receiving the stocking. The classic nutcracker design is dressed up with snowflake sequins, sequins on his uniform and belt, and face, and a candy cane in hand. The same design yet again, on a lighter blue background and with a little metallic thread added. This nutcracker picture is very similar to the preceding ones, but the proportions are different as well as the foot design. This stocking is modeled after existing family stockings that the customer wanted to match. If you'd like a stocking with a nutcracker or soldier picture, you can find out more about ordering custom Christmas stockings.